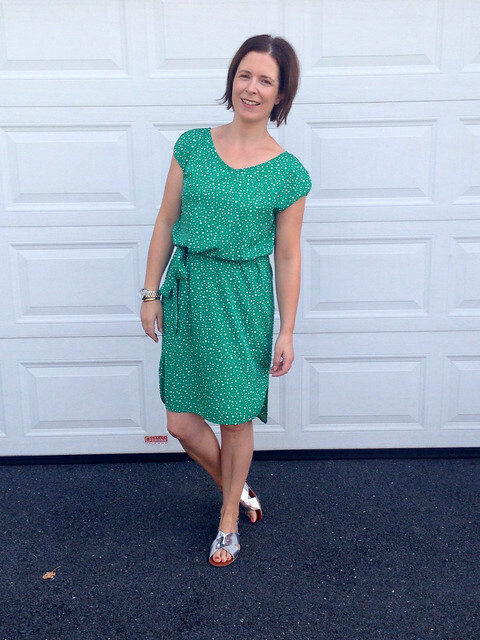 This dress from Great Plains couldn’t have arrived at a better time. I was sore, tired, hot and fed up and this little gem arrived at the door to cheer me up. This shade of green is becoming a firm favourite. After wearing my Boden mac, I realised it's a good colour for me and I'm keen to introduce more of it into my wardrobe. But I thought a dress would be a brave move and wasn't sure if I'd be able to pull it off but the style of the dress is so easy to wear. It's got a soft tie belt that can be tied as tight as you wish...and tying it allows you to 'ruche' the dress up a bit to make it more of a casual fit, as I've done here. Size-wise, I went for a M and could probably have gotten away with the S but it may have been a little too neat across the waist. I had the option of sizing down but decided to stick with the larger size. It was a super hot day when I took these pictures so I kept the outfit simple - just wore my Next silver sandals. I did try a few necklaces but it just didn't need them...the pattern spoke for itself. Looking at the Great Plains sale pages turned out to be a bad idea as I ended up buying a few other bits and pieces for autumn winter while I was on there...these Leopard Denim Slim Leg Jeans were calling to me and I tried them out yesterday with a plain black t-shirt and loved them..even though I should have really sized down to a 10 but they're all out of stock now. Nothing a belt can't sort out. I also bought this Trip to The City Wrap Buckle Cardigan though if you fancy it, be careful with your colour choice. The Grouse colour shows as a beige but it's not - it's a dark grey! I was actually happy with the darker colour so kept it but if you want the lighter one as pictured, I think it must be the 'Chèvre' colour you need to select! It's obviously too hot to try this one on at the moment but I'm looking forward to wearing it when it's cooler - love a cardigan/coat style for the school run as I'm always in the car. Need to stop the shopping....argh! What a great dress, great style and that colour really suits you, like it with the silver slides. Hope you are feeling better. Loving the cardigan, but just wondering how long it is? I'm only 5'2 so shorter than you, do you reckon it would be too long for me? Thanks Avril, lovely as it, I think that it may just be a tad to long for me. Worried I would look even shorter than I am. Found a few other bits that I like so not all lost. What size did you go for in the cardigan Avril? The dress is beautiful on you! I love Great Plains Avril, ashamed to admit how many dresses I have bought from them over the past few years, but they are always such great value in the sale....! Love this shade of green and it suits you a lot. Can't begin to tell you how many green necklaces I've spotted that would have been perfect with *that* outfit! Only worn the shoes once since as they kill me. 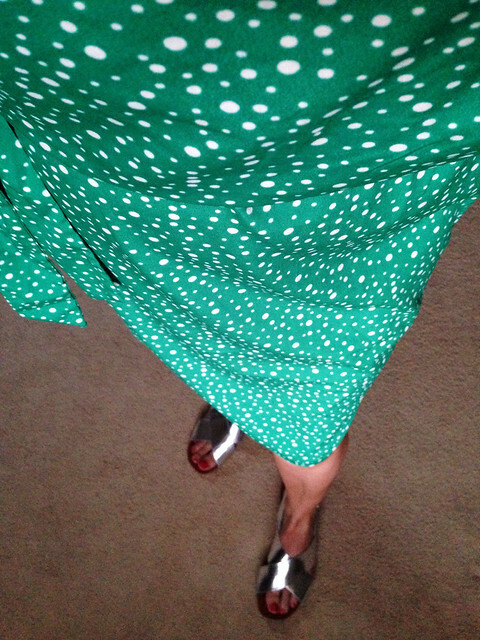 I love green, I wear it a lot & this dress is really lovely. Great shape. Not ordered anything from GPs for a few years but I always look just in case something jumps out as a must have! Love, love, love this dress. I'm a huge green fan and it falls beautifully on you. Saw this dress earlier in the season, it's very pretty, colour definitely suits you!